Sick of upset stomachs? Running out of steam in your races, don’t like gels? Then check out www.infinitnutrition.com.au. We custom blend your nutrition and make it into a drink. Use our Quick Start Interview to get started. Customise your nutrition. We are passionate about Infinit. Our mission is to provide an exceptional service in our drive to assist individual athletes to follow their dreams and achieve their performance goals. We customise sports drinks so people can take all of their nutrition in one easy to digest drink, there is no need for bars or gels. You can adjust your calorie intake, carbohydrate blend, protein, amino acids, electrolyte content, caffeine levels, and flavour to your specifications. Infinit is specifically designed so that is easy on your stomach and quick to digest. With 25 serves in our standard bag, it is extremely cost effective, being cheaper per serve than many other nutritional products. Infinit comes in a powder form. Each bag is individually made to your specifications. 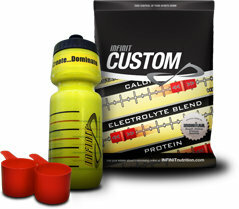 To order go on line to www.infinitnutrition.com.au, set up an account, then get started with the Quick Start Interview. This quick Interview will guide you through the process and give you a starting formula. Tweek your formulas using an easy slider to adjust your formula for different races and events.